公開日： 2016/05/11 : 最終更新日：2016/05/12 クッキークリッカー系 2BECOME1 Inc. The sea is now a great golden fishery! The Era of the Great Fishers has begun! Assemble the best men and take the challenge of becoming a Great Fisher! Though I began with a humble raft.. I will soon have an enormous ship! The great Gismu Jin devoted his life to finding the golden fishery! and now it’s time for me to set off on my journey! Easy for all to enjoy. Grow your character step by step. Benefit greatly even by just turning it on. 2. Sell fish at a good price. 3. Get a better boat and equipment. 4. Find legendary fishers and make them your team mates. 6. 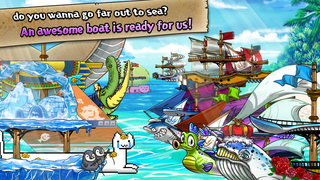 Battle it out with sea monsters! 7. Play frightful games with captains of pirate ships! 8. 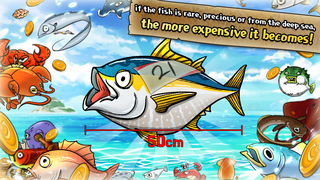 Collect black pearls and upgrade to become more powerful! 9. Find the golden fishery of the Great Sea Route! 10. Become a legendary Great Fisher!